Growing entertainment industry, increasing penetration of smartphones along with online gaming are some of the key factors which are driving the growth of UAE augmented and virtual reality market. In the overall AR and VR market of UAE, the AR segment alone accounted for majority of the revenue share and is expected to contribute further during the forecast period as well; attributed to increasing development of AR based apps and games resulting in high revenues of the AR segment in UAE. Additionally, head-mounted display segment contributed major UAE augmented and virtual reality market share due to its high utilization in gaming and education sectors. Among all the verticals, the entertainment application acquired highest revenue share of the market. Whereas, over the next six years, the commercial and automotive applications are forecast to grow at a higher CAGR during the forecast period. Also, in UAE, the Northern region held major share of the AR and VR market in terms of market revenues on the back of growing commercial sector in Dubai emirate. The Northern region is further expected to maintain its dominance during the forecast period as well. 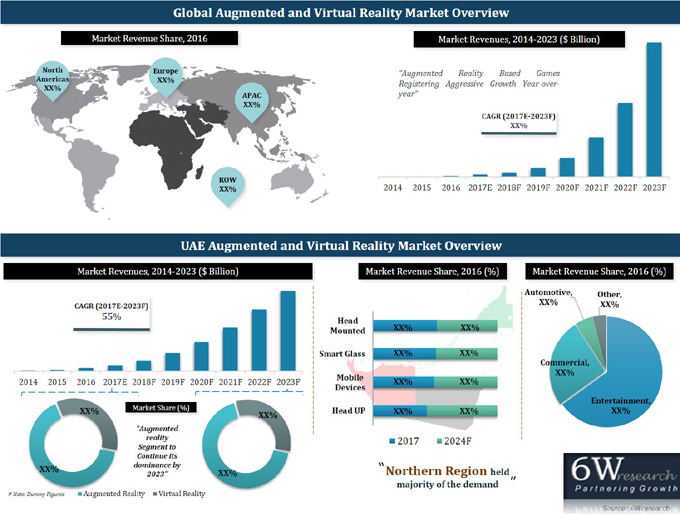 The UAE augmented and virtual reality market report thoroughly covers the augmented and virtual reality market by type, verticals, and regions. The UAE augmented and virtual reality market outlook report also provides an unbiased and detailed analysis of the UAE augmented and virtual reality market trends, opportunities/ high growth areas and market drivers which would help the stakeholders to device and align market strategies according to the current and future market dynamics.